There have been two Technology Tuesdays presentations on the iPad in the classroom: One given by me on the 31st August, 2010, and then a guest presentation given by Keith Mountin and Jack McLaughlin on the 6th October, 2011. I have combined resources from both presentations on this page. At the time of the launch of the original iPad, I felt that the lack of true video mirroring limited the use of the iPad in DePaul classrooms. The iPad2 (with the use of a dongle) does not have this restriction (and also has a video camera) and I now view this as a worthy device for student and faculty use in the classroom. Keith also mentioned Inkling and XanEDU in the presentation. Faculty can download free of charge one Inkling ebook for evaluation purposes. Personally, I am very impressed with their version of "Marketing Management" by Kottler and Keller - the ebook is well designed, with quizzes (pre- and post-tests), video, and more. I recommend looking at this product. From my perspective, most DePaul faculty and staff will be content with a WiFi iPad rather than the more expensive 3G iPad. Most applications on the iPad will not present on a projector. You will need a VGA adapter (projector) or an AV cable (television) to share your display. The Calendar, E-mail and Contacts applications on the iPad will integrate with DePaul's systems. This functionality is not supported by DePaul or the helpdesk, but I have not encountered any difficulty on my iPad. To set up these services, simply follow the DePaul iPhone instructions. iPads will work well on DePaul's wireless network. Follow the iPhone instructions here. There is a plethora of educational applications for the iPad. A complete list can be found here. The iBooks application on the iPad supports ePub and PDF. 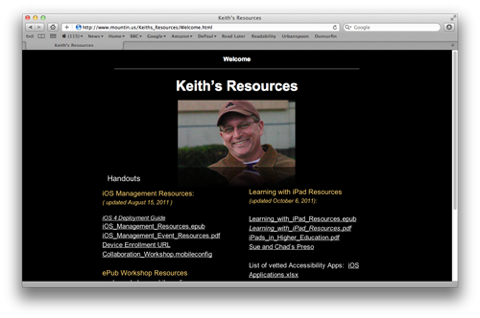 Additionally, iWork Pages will export to the ePub format. Book publishers are starting to release eTextbook applications for the iPad. CourseSmart (www.coursesmart.com) is a notable example. iTeleport is my recommendation for a VNC application. iTeleport will allow you to remotely control your office PC or Mac. You can download this video as a M4V file. This version will play in iTunes, QuickTime and on iPods, iPhones and Apple TVs. There is also a PDF handout you can download.